There aren’t a ton of pepper diseases that will plague you, which is fortunate. However, the two main diseases can pretty much decimate your plants if not controlled. Let’s take a quick look at the two most common ailments that can effect your pepper plants (bell, sweet and hot), and how best to avoid them. Nematodes: Plants are dwarfed, sickly, and will sometimes wilt readily in dry weather. Roots showing swelling or galls, and can let in bacteria. This is actually caused by a tiny worm, and if you get rid of the nematodes, you will remove the problem. These tiny worms infiltrate the root system, crippling and even killing the plant. Since nematodes are most prevalent in sandy soil (common in the southeastern US), you’ll need to take extra care if you live in this area. Move your garden to a different site in your yard, which may or may not be nematode-free. Solarize the soil (see below) then plant marigolds (which nematoes dislike intensely). Create raised beds for your garden, raised by at least 6 inches. You’ll need to dig out an area at least a foot deep and at least two feed wide. Then you’ll need to fill it back in with compost, composted manure, sphagnum moss, etc. Do not use any of the soil you dug out to re-fill the trenches. Plant your peppers in containers. Since pepper plants tend to remain under 3 feet tall (one notable exception being jalepenos), they are pretty well-suited for container growing. In fact, since I live in a nematode area, I grow all my peppers in containers. 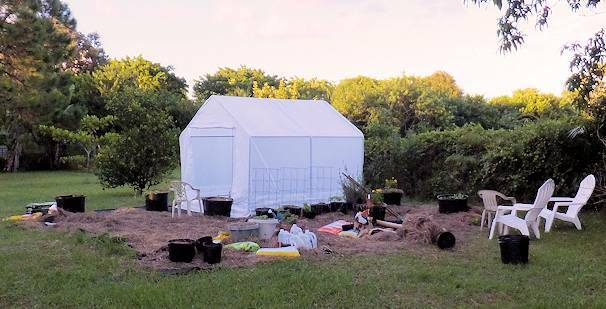 Solarizing: To solarize the soil, till the ground, then cover it with a thick, clear plastic. The sun will “bake” the soil, killing the nematodes. Since you also kill all the “good” bacteria by this method, so be sure to spread some compost over the solarized soil a week or two before planting. Tobacco Mosaic Virus: Green or yellow mottling of leaves; some curling, malformation, and dwarfing of leaflets. Plants slightly stunted. Fruits mottled by yellow strains of the virus. Can be passed from plant to plant by handling wet plants that are infected, then handling healthy plants (for example, when examining fruits on a damp morning.) This disease is widespread throughout the USA. 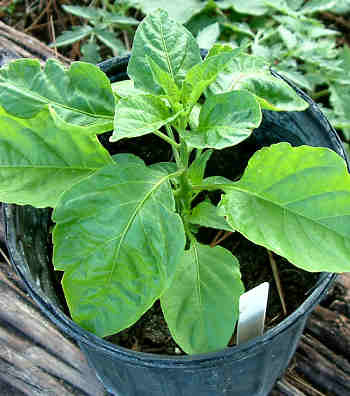 It’s thought that handling tobacco can transfer the virus to pepper plants. Some people say no, some say definitely. At any rate, if you do smoke or otherwise handle tobacco, it would be wise to wash your hands thoroughly before working with your peppers. Like their (far-flung) relatives the tomatoes, peppers can fall prey to bacterial infections. Fortunately, most peppers (in my experience) have been less-susceptible than tomatoes. Still, you want to make sure you have plenty of air circulation around the pepper plants, and that you don’t water the foliage (except with a foliar spray early in the morning before the dew has dried). my hot and bell peppers were beautiful. Its very hot here in N.O.LA.everyone was raving about how beautiful they were. and within this last week they look horrible. I found tiny bright white cateroillers(?) crawling on some. and I see little gold or light tah spots on lots of their leaves. Now I see aphids on underside of leaves.The little sopts are not leaf miners (I know what they look like). Seriously ? what could ruin a crop in a week?HELP ME PLEASE. should I just throw them away and start from seeds again?They are all in containers (about100 )Thank you for whatever help ya’ll can be. Ouch! That’s hard, to get all those peppers struck all the sudden — it sounds like you have a severe insect infestation. Here are some ideas. I probably would get rid of a lot of the pepper plants, and just keep the ones that look the best. And for those plants, you’ll need to wash the leaves and stems thoroughly with a lightly soapy solution — get a plant soap if you have any good garden centers around that have it. Them, once you have the plants washed and wiped clean, sprinkle them with diatomaceous earth, which helps to keep insects at a minimum. You’ll need to give the plants lots of air circulation, so make sure there is plemty of space around each plant. One place I like for organic pest control (and organic fertilizer) is Gardens Alive! which has a great selection. You might want to check them out. Best wishes, and I hope you can save some of your pepper plants! can jalapeno peppers be pickled/canned with vinegar only? I imagine so, but I wouldn’t suggest it, unless you planned to eat them or use the peppered vinegar quickly. Even though vinegar is very acidic, it can still go bad unless you use standard sterilization techniques. bell peppers have brown areas that develop early after the fruit forms. Also, the plants wilt during the day. As the fruit gets larger the area affected also gets larger, sometimes covering a third of the fruit. Wilting during the day is a sign that the plants are not getting enough water. And not getting enough water can stress the plants, which means that they are more susecptible to other things (molds, bacteria, etc.). Some peppers naturally have some brown areas, but bells aren’t one of them. My guess is that much of it may stem from not having enough water.